The US Capitol is not simply another governmental building. It is the spiritual center of the United States. Its structure, its art and its symbols all reveal the great importance of secret Fraternities in the shaping of the world most powerful government. 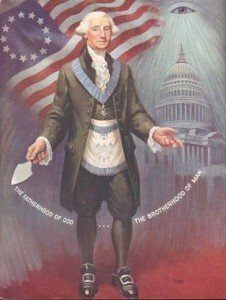 We’ll explore the Capitol and discover the features that make this building a Masonic site, an American Temple of Solomon. The Capitol is viewed by the average American as the seat of democracy, where big political decisions are taken. Very few recognize the spiritual elements of the architecture and the symbolism of the building which literally makes it a temple of Masonic mysteries. 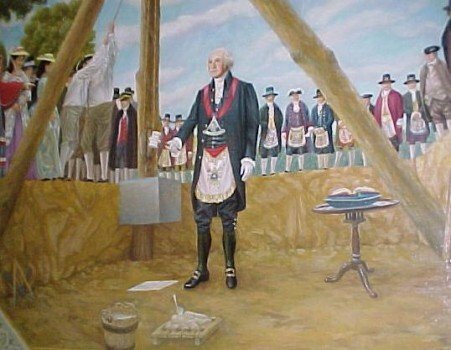 At the center of it all is George Washington, a 33rd degree Freemason being anointed as the “American Christ”. The building of the Capitol involved many notions unknown to the common man yet the builders seemed to give great importance to them: alignment with heavenly bodies, importance of ley lines, occult numerology, spiritual energy, etc. Those things might sound like “crazy New Age stuff” to the average Joe not to the Founding Fathers who attributed great importance the them. Here’s a look at the meaning of the Capitol. The Capitol, like all Washington DC, has been almost entirely designed by Freemasons and integrates within its architecture and artwork the “keys to the Craft”. The United States Capitol, at Washington, D.C., was the creation of a succession of architects who were almost all Freemasons. Originally designed by William Thornton (1759-1828), the work was completed by Brother Benjamin Latrobe (a pupil of the English architect Samuel Pepys Cockerell, 1754-1827) who also redesigned it after the War of 1812. The flanking wings and the great dome were added later by Brother Thomas Ustick Walter. Washington DC was carefully laid out in accordance to ancient occult principles. The Capitol is a vital part of the design by its location and its shape. The Capitol’s most important feature is of course its massive dome which carries heavy symbolic meaning, as we’ll see later. This dome faces the Washington Monument, the 555.5 foot tall (6666 inches) replica of an Egyptian obelisk. This layout is strikingly similar to St.Peter’s Square in the Vatican, where an obelisk faces a giant dome. St.Peter Square, Vatican. An obelisk facing a dome. The same layout can also be found in Paris, Astana and many other cities. There is no coincidence here: this layout carries an important alchemical meaning. In almost all cultures the dome has been associated with the female principle, the womb, the matrix. Opposed to it is the obelisk, the ancient Egyptian phallic symbol representing the male principle. The union of those two principles gives birth to a third entity, an offspring, that can be described as “spiritual energy”. Whether this energy is symbolic or a palpable reality is something that I’m not (yet) qualified to advance on. Many theories claim that shapes such as pyramids, domes and arches can either store, extract or diffuse energy from their surrounding area but I’ll leave this analysis to someone else. The theme of the union of male and female principles is very common in occult architecture and is surely the most easily recognizable. Let’s look at the Capitol. Imagine a straight line starting at the tip of the Capitol’s dome and going down, right to the crypt. This is how we’ll explore the Capitol. 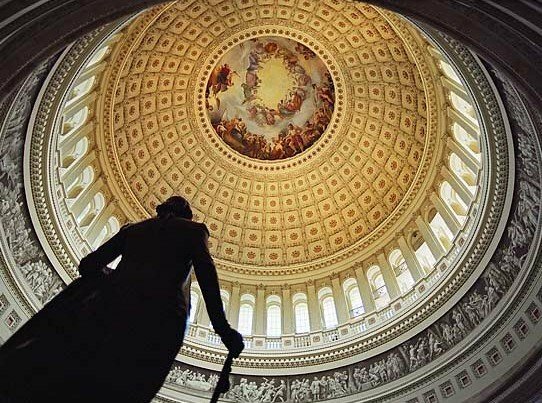 Standing at top of the dome of the Capitol is the enigmatic Statue of Freedom standing on a spherical shape, which probably represent Earth. Around this globe is the saying “E Pluribus Unum” (Out of Many, One). She is a female allegorical figure whose right hand holds the hilt of a sheathed sword while a laurel wreath of victory and the Shield of the United States are clasped in her left hand. The heraldic shield is the same as in the Great Seal of the United States, with thirteen stripes, except that the chief has stars (again, thirteen). Her chiton is secured by a brooch inscribed “U.S.” and is partially covered by a heavy, Indian-style fringed blanket thrown over her left shoulder. She symbolically faces east towards the main entrance of the building which means that incidentally, the sun never sets on Freedom. So who is this Goddess standing on top of America’s most important building and overlooking the state Capital? She’s certainly not the Virgin Mary (you’d be surprised at the number of people who think that) and she cannot be positively associated with any ancient goddess. Truth is, the district bears her name. D.C. = District of Columbia. She is the allegorical goddess of America, the typically American mythological figure, Columbia. 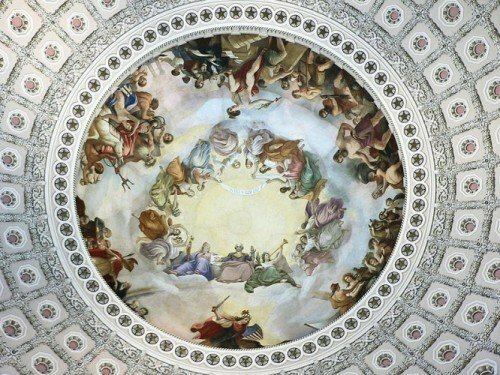 The dome of the Capitol features in its occulus an incredibly significant painting that reveals the philosophical, spiritual and political aims of the Founding Fathers. Rare are the writers have discussed the gnostic, alchemical and esoteric meaning of this work, yet it has been visited by millions of tourists. The interesting book “Freedom’s Gate” written by William Henry and Mark Gray is the only work I’ve found analyzing the mystical meaning of this painting called “The Apotheosis”. An apotheosis can be defined as the exaltation of a subject to divine level. In other words, this painting depicts the elevation of George Washington to a god-man status, like Jesus Christ. He is shown seated on a rainbow and behind him is the gateway, the vortex, the sungate to the heavens (the spirit world). As stated above, the dome esoterically represents the womb giver of life. Washington is about to exit the womb of the dome to experience rebirth as an immortal god. William Henry has appropriately noted that Jesus Christ’s divinity was portrayed in a similar way in ancient religious art.